Ever inclined to follow his own path, Gilchrist showed up at the Cleveland Browns’ training camp directly out of high school. He failed to make the team and, foregoing college, went to Canada instead where he played for seven years with three teams in the CFL. Big, fast, and multi-talented, Gilchrist excelled on both offense and defense, but also wore out his welcome with each club. He came to the Bills for the 1962 season and moved directly into the starting lineup at fullback as well as handling the team’s placekicking. Gilchrist led the AFL in rushing with 1096 yards and scored a total of 128 points on 15 touchdowns, 8 field goals, and 14 PATs. He was named AFL Player of the Year by the Associated Press and UPI and received consensus first-team All-AFL honors. Injuries hindered his performance in ’63, although he came on strong in the second half of the season. Bills went 7-6-1 to tie for first place in the AFL Eastern Division. Lost Divisional playoff to Boston Patriots (26-8). 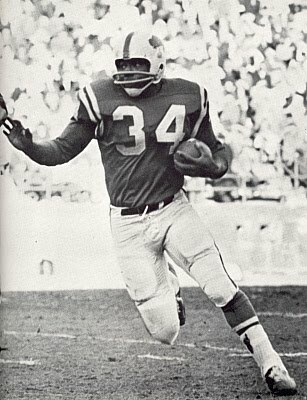 Gilchrist led the AFL in rushing for a second time in 1964 (981 yards) in a title-winning year for the Bills, but became embroiled in conflict with Coach Lou Saban, was briefly suspended from the team, and in the offseason was dealt to the Denver Broncos. He again led the AFL in rushing attempts (252) as he ran for 954 yards in 1965. However, there was more turmoil and Gilchrist was traded to the expansion Miami Dolphins during the ’66 season where, playing on bad knees, he gained 262 yards in eight games. He returned to Denver in 1967 but saw scant action and retired. Altogether, Gilchrist rushed for 9204 yards (4911 in the CFL, 4293 in the AFL), caught 196 passes for 2203 more yards (86 for 1068 yards in the CFL, 110 for 1135 yards in the AFL), and scored 78 TDs (35 in the CFL, 43 in the AFL). An outstanding blocker as well as runner from scrimmage, he received consensus first-team All-AFL honors three times and was selected to four AFL All-Star Games.